There’s a shipping container sitting outside 14th-century Dartington Hall in south Devon, offering cheap flights to an unspecified destination. Even by the standards of today’s budget airlines, Flight, by theatrical production company Darkfield is cheap. How do they do it? Part of their winning formula, I think, must be the way they kill their passengers. Because one thing is for sure – the plane I seemed to be on (mocked up to a high degree of realism, with seatbelts and overhead luggage bins and a safety card in the seat pocket in front of me describing what action to take in the advent of some difficult-to-parse existential disaster; then, once the lights went out, magicked from the absolute darkness of the shipping container by an immersive binaural soundtrack) that plane, as I was saying, most certainly broke up in the air. I heard the screams. Some of them may have been my own. Afterwards, armed with a steadying pint from the nearby White Hart pub, I had to admit, however, that life had not altogether left me. Was I alive or dead? Had I flown on an orange airline, or a blue one? To steady myself, I dug out my laptop and began editing my interview with Flight‘s co-producer David Rosenberg. Rosenberg and the Darkfield company are no strangers to Dartington Hall. Their first blacked-out and binaural entertainment, Séance, ran here in 2017. And while they’re a company known for pushing the boundaries of performance, their presence is by no stretch a novelty for the estate which, since its purchase in 1925 by social experimenters Dorothy and Leonard Elmhirst, has been attracting artists, educators and political philosophers in an effort to develop new ways of living. 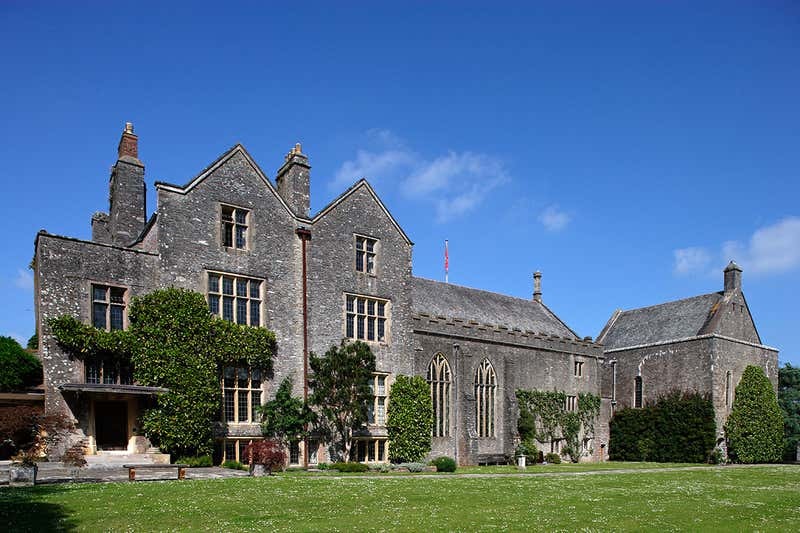 The work of the Dartington Hall Trust, which aims to maintain the estate as a place of radical experimentation, a model of rural regeneration, and a centre for progressive ideas and innovation, sounds hippyish – it is hippyish, in important respects – but that’s not to say it’s unserious. On the contrary. Important British institutions, including the National Health Service and the Arts Council, were conceived here. A community devoted to self-renewal, the 1,200-acre estate is deep into ground-breaking experiments in land use, farming and housing, and artistic and social projects that involve the estate in the lives and aspirations of some of the most deprived communities in Britain. Darkfield’s offering is certainly likely to draw interest from all manner of people. Maybe not the timid, though. Scanning the transcript of our recent phone interview, I see that Rosenberg, a medical anaesthetist turned theatrical impresario, called the recent output Darkfield “a terrifying fairground of darkness”. He was joking. I think. Simon Ings That’s a long list. David Rosenberg But a short show. Glen Neath and I have been making performances in complete darkness using binaural sound for the last six years or so. But the commitment to sitting in a theatre for an hour in total darkness is a big one, so we’ve now begun making shorter, more intense pieces in shipping containers: pieces that would explore fear and anxiety in different ways. Using the container means we can tour our material to places where audiences will engage with it in a different way – treating it a bit more like a fairground ride. SI With this form of presentation, are you fated always to be exploring the uncanny? DR I think we’ll be able to broaden our output as we develop. But for now, by putting people in an environment where they feel quite vulnerable, the uncanny plays a large part in what we do. Our first piece, Séance, dealt with our beliefs about death and the beyond. Flight began, obviously enough, with the fear of flying, but then we got interested in the work of physicist David Deutsch and the many-worlds interpretation of quantum mechanics. There’s a peculiar interpretation of the many-worlds model, not very well regarded but irresistible, called the quantum suicide fallacy. Suppose all probabilities are played out in the quantum realm: then we will only have a conscious experience of iterations in which our consciousness survives. So, in this respect, it’s impossible to die in a plane crash. Of course it’s also possible to be the only survivor of a plane crash, or the horribly mutilated sole survivor of a plane crash, or the only person in the crash to be hurt, and so on: it’s maybe not that much of a comfort. But this is the game we are playing in Flight. You perish and you survive, at the same moment. SI Why plunge your audience into darkness? DR In most instances vision is our leading perception. We attach sounds to images, rather than the other way around. You can show this with auditory illusions in which people moving their lips in a certain way but the sound that you hear is related to the lip movements. SI So we’re all lip-readers! DR To some degree, yes. We wanted to make work that wasn’t led visually in any way, and to achieve that we need darkness. In the dark, we can start with the sound and create environments and characters and to allow the audience to create visuals for themselves, in their imaginations. SI You first worked with Darkfield co-founder Glen Neath on Shunt in 1988 – the theatre company that pioneered immersive theatre in the UK. Why, with that background, did you decide to turn the lights out? DR As we explore virtual reality and augmented reality we’ve begun to to notice that a lot of immersive techniques provide experiences that are are paradoxically less immersive than old media. “Immersive” has become an entertainment buzzword. I joked the other day about going to an immersive funeral: it was very sad, and it smelt a bit like bread. Sure, we could reach a point where virtual reality is indistinguishable from real life; but then it would be real life. Quite a lot of popular virtual reality experiences involve doing incredibly mundane things. The human imagination, on the other hand is — or at any rate feels — limitless. I have been more immersed in a book than I’ve ever been in a 3D film. Immersion isn’t about drowning the senses. It’s about providing enough gaps for our imagination to fill. SI Have you gone any further in exploring sensory deprivation? DR We’ve used anechoic chambers to strip sound of all its reflections, so it literally becomes sound from nowhere. But we haven’t really thought of a way to bring that into a performance context. The problem is the body itself is incredibly noisy. As soon as you remove all the other sounds, then your body really makes a racket and you end up focusing on that. For myself, I remember in the late 1980s I went to a sensory deprivation tank in Manchester that was set up in this guy’s flat. There was a bit of a vogue for the idea at that time. It was a very basic experience: a body temperature bath with enough salt in it that you floated, in complete darkness and quiet. Just before he closed the door on me, the last thing he said was, Don’t touch your face. DR So of course I spent the whole time not touching my face, wanting desperately to touch my face. DR It was a bit stressful. A visit to IWM Duxford for New Scientist, 5 July 2017. The artist Nick Ryan showed me round his new sound sculpture, DX17. THERE are many stories at the Duxford airfield, Cambridgeshire. How it served British and American military interests for 100 years. Why Alexander Graham Bell wanted to call his daughter Photophone. How a technologist in Tasmania came half way round the world to the UK, only to discover that the technology he was developing was being used to send messages between mountaintops in – of all places – Tasmania. Luckily for me, I’m being shown around DX17, Duxford’s new sound sculpture, by its creator Nick Ryan, a sound artist who is good at making sense of complicated stories. It was Ryan who recreated the soundscapes of the Yangtze river and spread them along a pedestrian bridge at Gatwick Airport’s Skybridge. He also incorporated the orbits of 27,000 pieces of space junk into a musical instrument called Machine 9. DX17 is made of netting stretched over a steel skeleton. It’s an aerodynamic abstract with protrusions that suggest design elements from iconic aircraft. The first thing you notice are the lights: the sculpture is filled with 100 spotlights, their beams playing through the mesh of the sculpture and onto the floor. Yet DX17 contains more sound than vision. Hidden in each beam is a sound recording selected by the Imperial War Museum – some originals, others documents read by Duxford staff and volunteers. Together, they celebrate the base’s 100 years of aeronautical activity. Weaving these recordings comprehensibly through an object no bigger than a Spitfire was a technical challenge. Ryan and his project partner Sean Malikides opted to use light after deciding that digital solutions were clunky and historically inappropriate. Each light shines a flickering beam through the mesh of the sculpture – a sound signal carried on light. 3D-printed handsets with a lens at one end turn the signal back to audio, and play it through headphones. Visitors can press their “light-catchers” to illuminated spots on the sculpture, or catch beams projected from the sculpture onto the floor. Here and there, two beams intersect, and through your headphones, two audio samples blend. As you step away from a light source, the voice in your headphones – an airman’s memoir, instructions to ground staff, a loved one’s letter, a child’s recollections – slowly fade. It wasn’t until they were testing their system that Malikides came across the pre-history of this “li-fi” tech. Alexander Graham Bell invented it, using sunlight and a deformable mirror to send sound information across space. In 2005, enthusiasts in Tasmania used a similar system to signal between mountaintops some 160 kilometres apart. Bell considered the photophone more important than the telephone and wanted to name his daughter after the invention. His wife persuaded him that Daisy would be kinder. There are many stories here. Good hunting. Fade to black. Transmission ends.